Temecula is one of the most historic communities in Southern California. From Indian village to mission outpost, Mexican rancho to crossroads settlement, railroad town to modern city, the story of Temecula is rich and varied. The name Temecula comes from the Luiseño Indian word “Temecunga” – “temet” meaning “sun” and “-ngna” which means “place of”. The Spanish interpreted and spelled the word as “Temecula” translated to mean “Where the sun breaks through the mist”. Temecula is the only city in California to still retain its original Indian name. The hillsides of Temecula were the home of Temecula Indians, the first residents of the area. Ancestors of Temecula Indians were here as early as 900 A.D. The Luiseno Indians still inhabited Temecula in the 1700’s when the first Spanish padres arrived. The first known European man to set foot in this area was a Franciscan padre, Father Juan Norberto de Santiago, who arrived in the valley in 1797. It was during this period that the Pala Mission was built and Christianization of the native Indians began. The mid 1800’s reflected changing Mexican politics as governors of the province began making land grants to individuals to maintain control of the area. In 1845, Rancho Temecula was granted to Felix Valdez. 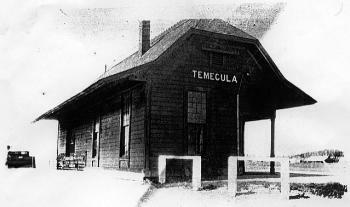 In 1858, Temecula became a stop on the Butterfield Overland Stage route establishing the area as a hub for commerce. In 1859, Temecula Post Office was established as the first post office in inland Southern California. The stages brought new settlers to the area and mail became an important link with the rest of the country. The Civil War put an end to the great Butterfield Overland Stage Service; however in 1882, a rail line from National City to Temecula was completed with regular service between the two cities. This provided access to and from San Diego and a minor business boom began in Temecula. In 1883, the line was extended to San Bernardino further providing for flourishing commerce, however, a series of floods in the 1880’s washed out the tracks and the railroad was finally abandoned. Early in the 1900’s, new roads helped to open up Temecula to the outside world. Vincenzo Cilurzo planted the first commercial vineyard in 1968 and by 1984 there were eight wineries in operation. The City of Temecula was officially named and incorporated in 1989. Temecula began to grow at a remarkable rate and today Temecula’s population is over 100,000. Yet in spite of such rapid growth, the City of Temecula has found a way to retain a sense of its past, a connection to its history and a bright outlook on its future. Preserving Temecula’s Old West heritage and charm has been a success as the beautifully restored Old Town Temecula has become a favorite spot for one-of-a-kind shopping and exploring with antique dealers, art galleries, exclusive boutiques, museums, unique dining, weekly Farmer’s Market and special events year-round. History buffs can wander the streets of Old Town Temecula viewing rustic buildings, sidewalks and storefronts reminiscent of our historic golden west in the 1880’s.